Make sure you're ready for anything, whether it's an off-road adventure or a formal suit-and-tie event, by installing Jeep Wrangler grab handles in your ride. This Mopar grab handle and coat hook combo can be used on soft-top and hard-top Jeep Wranglers, and they attach around your vehicle's sport bar. 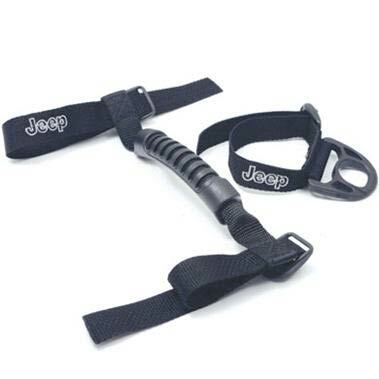 The non-slip handle features an embroidered Jeep logo, and you can order one or a pair based on your needs. Grab Handle and separate Clothes Hook. Attaches around sport bar. Handle has embroidered Jeep logo. For a pair of grab handles please click here. This is a great product; well designed and very practical and useful!! Thumbs Up!! I got one for the passenger side to help my wife get in . She said it does help her .It looks good with the JEEP logo and easy to install. I purchased two sets for my 2-door Wrangler. Extremely well crafted and easy to assembly. ProsMade well and include the Jeep name. ConsComes with Coat Hook I'll probably never use. I had these on a previous Wrangler and they were awesome! What you see in the catalog is what you get...unlike the competition. Easy to install and does give that little extra help in getting into my Jeep. The handles are not in the way when getting out of the vehicle. The coat hangers work great. ProsEasy installation and gives you that extra boost you may need in getting into your Jeep. Plus they look great. ConsThey do move on the roll bar when used.